The weather is perfect for looking for Asian Citrus Psyllid. There is new flush and that is where the adults go to lay their eggs and feed. This is also the tissue where aphids and scale crawlers will be found, as well. ACP has been active all this winter, but now is when they are going to be the most noticeable. Get out there and look and alert the CDFA Exotic Pest Hotline to confirm a find, 1-800-491-1899. ACP adult and nymphs with waxy exudate from nymphs. This February there was a four day international conference in Orlando, FL that attracted 467 people from 21 countries, including about 20 from California. There were 87 oral presentations and over 80 posters that covered all aspects of Huanglongbing, the insect vector (Asian Citrus Psyllid or ACP), disease detection, insect control and monitoring and a whole lot of information on the genome of the bacteria, how it compares to other infectious bacteria and what can be done to exploit its genetics to control the disease. To learn more, the proceedings and agenda can be found at: http://irchlb.org/hlb/schedule.aspx. To start off, this is an amazing example of coevolution among a plant, a bacteria and an insect. It appears that the citrus tree may give off an odor which at low concentrations acts as an attractant, but at higher concentrations is a repellant. The infected tree also gives off volatile organic compounds (VOCs) that can be used to identify affected trees. These chemicals are not pheromones which are social odors emitted by some insects which act to affect insect behavior, such as mating or causing aggregation. Being able to use these new odors will allow for better methods of monitoring the insect with lures. We currently use blunder traps which are not a very good indication of whether there are ACP present. Currently the most commonly used technique for identifying infected trees is the use of the polymerase chain reaction (PCR) method which is a biochemical technology that identifies the presents of the bacterial DNA. This method was used on the leaves of trees since that is what the psyllid feeds on and where the bacterial infection starts. Results have been erratic and inconsistent and often would not give results until many months after the infection started. The bacteria clog the phloem tissue which carries sugar to the roots and on which the psyllid feeds. The higher concentration of sugar accelerates the development of the insect and it can lay more eggs. The bacteria travel down the stem at measured rates of one centimeter per day and accumulate in the root system. The root tips are the growing points and where the plant directs sugar to feed the new root growth. It is from the roots that the bacteria go out to all points of the canopy where it can then be picked up by uninfected psyllids which can then go on to find a new tree to feed on. By measuring root tips, rather than leaves, the detection is more rapid and much more consistent, since the bacteria levels are higher in the tips than the point of infection. Disease detection is now being improved by better understanding of the biology of the infection process and thereby allowing faster determination of whether a treatment works. The ability to evaluate what treatments work has allowed researchers to determine such things as what rootstocks and scions might be most vulnerable, what spray programs are the most successful and how better to lay out trials. It turns out that there is an edge effect during a psyllid invasion and that the first affected trees are right on the perimeter. By focusing spray programs in this area can slow the movement of the insect to the middle of the orchard. Actual economic control of this pest and disease are still some time away, but with this new understanding of the disease process we will be closer to finding a solution. For the last few years citrus growers in the San Joaquin Valley have been nervously watching the establishment of Asian citrus psyllid in southern California and bracing themselves for the day of northward movement. That day arrived in November 2012 when two psyllids (Strathmore 16 Nov. and Terra Bella 21 Nov.) were caught on yellow sticky card traps, in addition to a third capture back in January 2012. These captures have now resulted in restrictions on the movement of citrus in the heart of California's principal citrus production region. 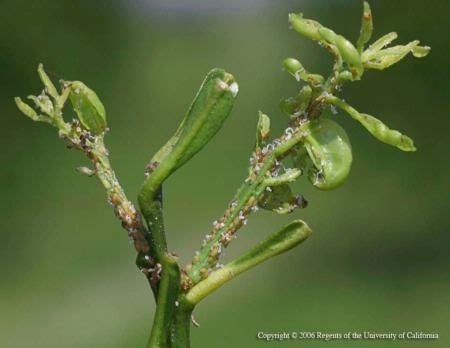 Asian citrus psyllid is a small insect the size of an aphid that feeds on citrus leaves and stems. It is the vector of a deadly bacterial disease of citrus called huanglongbing, often referred to as HLB or citrus greening. 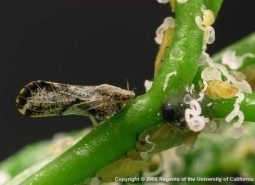 This pest and disease combo has resulted in devastating losses to the citrus industry in Florida, and has the potential to have a similar affect in California. Prior to November 2012 Asian citrus psyllid had been reported in eight California Counties, mostly in the southern part of the state, with a combined total of approximately 26,000 square miles under quarantine. 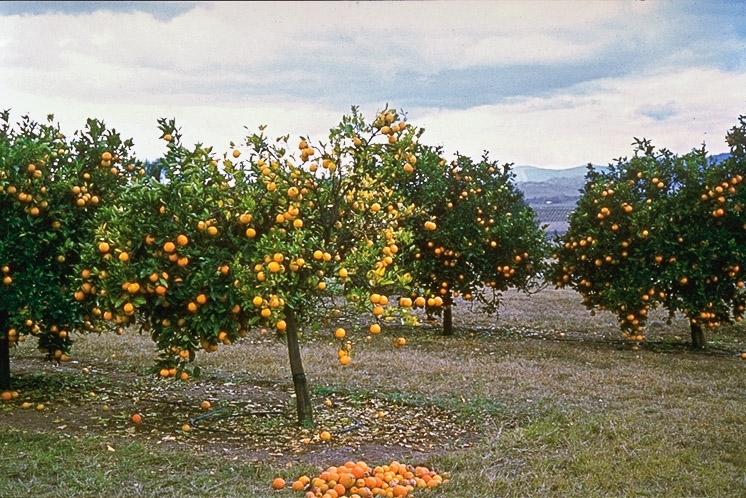 However, the two finds in Tulare County mark the first time the psyllid has been found in the heart of California's principal citrus production region of the lower San Joaquin Valley: Kern, Tulare and Fresno counties produce over 200,000 acres of citrus at an annual value of approximately $1.7 billion. The capture of individual psyllids on sticky traps in Strathmore and Terra Bella gives CDFA the authority to establish a quarantine of citrus within a 20-mile radius of the find in Strathmore. Prior to doing this, however, CDFA has opted as an interim step to only regulate citrus in a 5-mile radius around each find until further trapping and delineation can determine if psyllids are truly established in the region, or if the psyllids caught were just non-breeding hitchhikers brought to the corridor along State Highway 65 from infested counties in Southern California. If further delineation detects an established population it is anticipated that quarantines would be established. If established, a quarantine for Asian citrus psyllid would last a period of 2 years since the most recent capture. If additional psyllids were captured during the two-year quarantine the clock would reset itself for another two years. 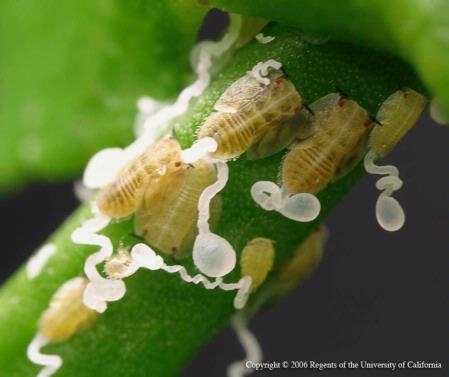 Due to the fact that the psyllid only feeds on leaves and stems (and not fruit), citrus growers within quarantine zones in California have several options for harvesting and shipping fruit. Fruit harvested within quarantine zones can be picked, transported and packed within the quarantine zone without restrictions. Once clean fruit is packed (no leaves or stems) it can be shipped to locations outside of the quarantine. Packing fruit from within the quarantine at packing houses outside of the quarantine is also possible under a CDFA compliance agreement that can be accessed through the County Agricultural Commissioner. These agreements state that the grower is willing to comply with CDFA and USDA regulations regarding the movement of bulk citrus, the most important of which is that bulk citrus must be processed through trash-removal equipment (to remove all leaves and stems) before it is shipped in bulk to a packer outside of the quarantine. 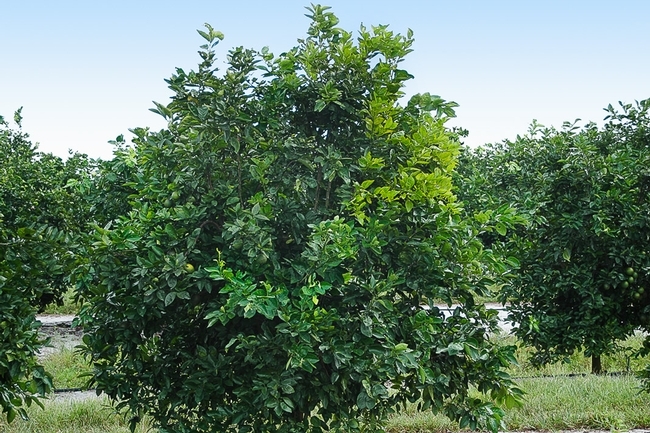 The Asian citrus psyllid quarantine also affects retail nursery stock. Currently there are compliance agreements and protocols available that allow retail nursery stock to be moved within the quarantine zone. However, no provisions are currently available to move nursery stock from the quarantine zone to regions outside of the quarantine zone unless the plants were budded and produced within a federally-approved screenhouse facility. Photo below. Asian Citrus Psyllid nymphs with waxy exudates from feeding. Trying to stay abreast of the insect and disease it carries to citrus? The Ventura County Farm Bureau and Ventura County ACP-HLB Task Force have put together links and a Facebook page that have all the latest breaking news concerning the threat to California’s citrus industry and to the iconic backyard tree. This is one of the best ways to find out how this pest/disease complex is being dealt with.